Welcome to the Mathematics Department's website. 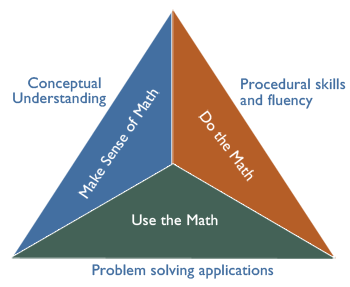 The goal of the Mathematics Department in Cambridge Public Schools is to ensure that children have learning experiences that create lifelong problem solvers who can collaborate, adapt, and adjust to a diverse and an ever-changing society. The actions of the math department are designed to ensure instruction that is equitable and rigorous and that supports each school in becoming a multi-generational math learning community. We strive to create equitable mathematics communities that engage all students in making sense of challenging mathematics, provide all students with access to challenging curriculum and empower students to participate meaningfully in mathematics discourse? On this site, you will be able to understand more of what we teach in the math department from Junior Kindergarten to Grade 12. We are working to make sure that this site meets your needs, so please feel free to contact us if there is anything else you'd like to see on this site. Teachers, coaches, and administrators continue to develop and refine curriculum maps to better align with the math standards, developing strategies to support making student thinking visible, deepening strategies to effectively differentiate instruction, and focusing on vertical alignment to support student mathematical growth from sixth through ninth grade. This work will continue throughout the coming years. If you have questions or concerns about your student’s progress in upper school, we encourage you to first reach out to the classroom teacher.